This is a Flickr badge showing public photos from Flickr tagged with elcouncil. Make your own badge here. Over at Yester P7's "Year in Yester" blog the last couple of days have seen a flurry of creative new posts. Why not take a look - and maybe leave a comment while you're there? However, instead of actually filming in Haddington, the children went one step better, and created their own “set” of the High Street in winter. They then filmed the street, going down one side and coming back up the other. 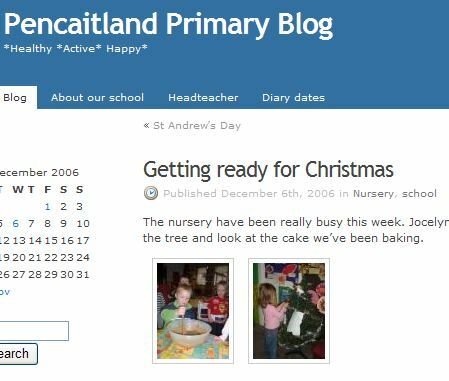 Pencaitland Primary School have started using a school weblog for news of what's happening in the school. This is a small school, of just over 200 pupils, and the blog has contributions from pupils in various classes. They've had a few comments on their blog, but would be delighted to get a few more! If you get a chance, why not visit their blog and give them some feedback? Trained in England. Teaching in Scotland.